Māori quickly adopted food sources introduced by Europeans, growing potatoes, gifting pigs to other tribes, and developing large wheat plantations and mills. In the early 1800s, pigs and baskets of potatoes were used as currency. Early European explorers introduced a wide range of food plants to New Zealand, including wheat, maize, potatoes, cabbage and carrots. An American whaler introduced a variety of kūmara (sweet potato) that was larger than the kūmara Māori previously grew. Before Europeans arrived, the only animals Māori had for meat were kurī (dogs), kiore (rats) and birds. Early explorers brought pigs, goats and hens. The governor of Norfolk Island gave many pigs to chiefs in the north. Māori tribes gave each other pigs, and traded them with Europeans. Māori started growing potatoes soon after Europeans brought them to New Zealand. Potatoes looked like kūmara and were grown in the same way – but, unlike kūmara, they could grow in cooler areas and produced large crops. In the early 19th century, pigs and potatoes were used as currency – in 1820, a musket (gun) cost 200 baskets of potatoes or 15 pigs. In the 1840s, the price of a horse was 40 pigs. Māori traded potatoes, pigs, maize and other food with Europeans. War parties took potatoes with them when travelling, and tribes used potatoes to buy muskets. At large hui (meetings) pigs and potatoes were an important part of the feasts. At one hui in 1881, nearly 3,000 baskets of potatoes, and several hundred pigs were cooked and eaten. Tribes planted wheat, which they sold to settlers and exported to Australia. At first they had hand-powered flour mills. Later they built water-powered mills. 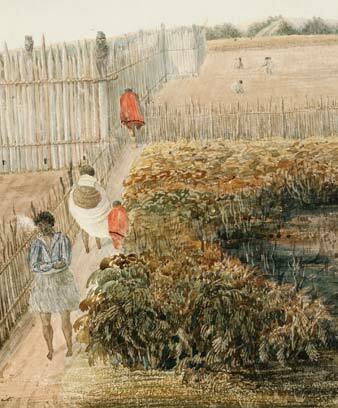 Missionaries and other Pākehā encouraged Māori to grow wheat, and gave them money to build mills, sometimes in exchange for land for European settlement.